To repent means to regret, be sorry, feel sorrow or feel ashamed for any wrong done. 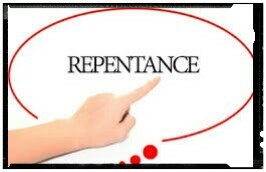 Therefore, repentance is the act of regretting or feeling sorry or ashamed for any wrongdoing. It is the realization that what we have done is bad/wrong and we are ready to apologize and ask for forgiveness. David was the second King of Israel. The Israelite army was fighting against the Ammonites. David did not go to fight the war. One day as he was walking on the roof top of his house, he saw a beautiful woman next door taking her bath. David asked his servants who the woman was. They told him that she was Bathsheba, the wife of Uriah, the Hittite, one of his soldiers fighting in the war against the Ammonites. Later, he told his servants to bring the woman to his palace. The woman came and David slept with her and she became pregnant. David called Uriah from the battlefield and tricked him to go home to sleep with his wife so that (he) David could make him responsible for the pregnancy. But Uriah refused and in the end David had him killed in the battle. David then married Bathsheba, who later gave birth to a son. David did not feel sorry for the wrong he had done. Therefore, God sent the prophet Nathan to call him to repentance. Nathan told David the story of a poor man who had one lamb and a rich man who had plenty of sheep and goats. One day, the rich man had a visitor and he took the lamb of the poor man and killed it for his visitor. When David heard the story he became angry and said the rich man should be put to death. The prophet told him that he was the ‘rich man’ in the story. When David realized that what he had done was wrong, he repented. He felt very sorry and asked God for forgiveness; and God forgave him. The call of David to repentance and his response is found in Psalm 51. Zacchaeus , a short man, was a chief tax collector in the town of Jericho. He used to cheat the people by collecting more than the tax he was supposed to collect. He made use of the surplus tax for himself (fraud). One day, Jesus was passing through Jericho to Jerusalem. Many people came to see him. Zacchaeus was among them. But because he was short , he climbed a tree to see Jesus pass by: When Jesus reached where Zacchaeus was , he asked him to come down from the tree. Jesus told him that he would spend the night in his house . Zacchaeus was very happy and walked Jesus to his house. The people of Nineveh were evil in their ways. They did many evil things to one another. They were wicked. They did not help those in trouble. They did not feel sorry for all the wrong that they had done and they continued to do. God told the Prophet Jonah to go and call the people of Nineveh to repentance otherwise He would destroy them. At first he refused and ran away from God’s directive to Tarshish but later went to the town of Nineveh and called the people there to repentance. God said through Jonah that Nineveh would be overthrown in forty days time. The people felt sorry of all the bad things that they had done. They repented by proclaiming a fast, putting on sackcloth, the king arose from his throne, removed his robe, and covered himself with sackcloth and sat in ashes and asked God for forgiveness. And, God forgave them. God sent John the Baptist to the Jews to call them to repentance. He preached to them the baptism of repentance for the forgiveness of sins. The people regretted their wrong doings. They came to John to confess their sins. John the Baptist baptized all the people who repented of their sins. Then, they asked John the Baptist what they should do and he told them to be of good behaviour. John the Baptist then told them that the baptism of repentance for the forgiveness of sins was to prepare them for the coming of Jesus Christ, who will baptize them with the Holy Spirit. to melt the heart of stone that caused them to do evil things replacing it with the heart of flesh. He will allow the Holy Spirit to give them spiritual power to obey God and to become righteous. 2. give account of the circumstances surrounding Uriah’s death. 3. itemize how Zacchaeus responded to the call to repentance. 1. Outline how the people of Nineveh responded to the call to repentance. 2. What was the theme of John the Baptist message? Read 1 Sam. 3:18, 4:10-21. Zacchaeus come down from the tree.